One of the easiest ways to improve your photography is to master depth of field. In simple terms, this is the distance in your photo between the nearest object in focus and the farthest. Aperture priority mode is just the tool you need, and the best way to learn how to use it is simply to experiment with it. The aperture setting controls how much your camera lens opens to capture the image you're shooting. It works like the pupil of an eye: the more the pupil dilates, the more light and image info are admitted into the brain for processing. Aperture size works with shutter speed to determine the depth of field, which be the difference between a good photo and a great photo. Imagine a landscape shot in which only the first few inches of the image are sharp or a photo of a chair in which it and its background are in equal focus. To select aperture priority mode, look for the A or AV on the mode dial on the top of your DSLR or advanced point-and-shoot camera. In this mode, choose the aperture, and the camera will then set an appropriate shutter speed. When shooting a landscape (which requires a wide or large depth of field) choose an aperture of around f16/22. When shooting a small object such as a piece of jewelry, however, a narrow depth of field will help blur the background and remove distracting details. A small depth of field also can help pull a single figure or object out of a crowd. An aperture of between f1.2 and f4/5.6, depending on how small the object is, would be a good choice. It's can be easy to forget about the shutter speed when you're concentrating on your aperture. 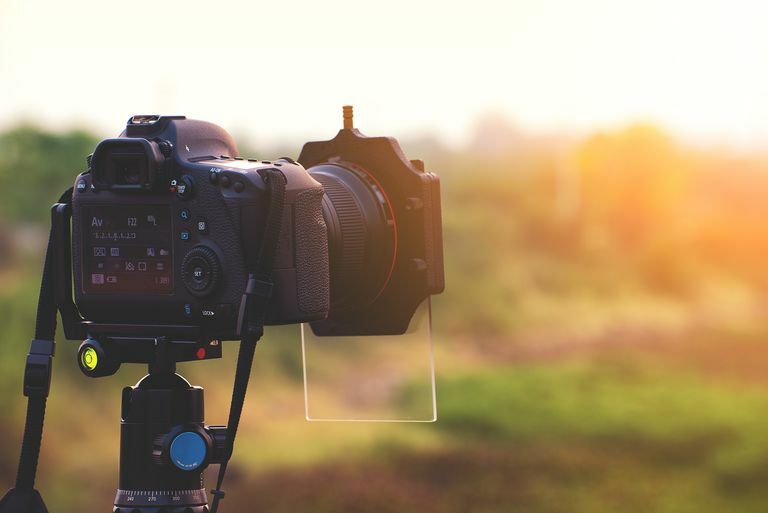 Normally, the camera won't have a problem finding a suitable speed, but problems can arise when you want to use a wide depth of field without much available light. This is because a wide depth of field uses a small aperture (such as f16/22), which lets very little light into the lens. To compensate for this, the camera will have to choose a slower shutter speed to allow more light into the camera. In low light, this can mean that the camera will choose a shutter speed that is too slow for you to hold the camera by hand without causing blurriness. In these cases, the most common solution is to use a tripod. If you don't have a tripod with you, you can increase your ISO to compensate for the lack of light, which will then push up your shutter speed. Just be aware that the more you push your ISO, the more noise your image will have.